"I was close to the farmhouse where I worked when I noticed 10-12 very small men approaching. They were at a distance of around 50 meters when I discovered them and they came in my direction at a fast pace. They were so small, they reached only to my knees, and I remember this strange sight frightened me." The men pass by Helge only a few meters away and in the bright moonlight he gets a good view of their appearance and dress. The small entities are wearing dark green clothes with caps. To Helge their dress appear to be made in one piece. All the men wear a beard but their heads are unusually large compared to their bodies. Facial expression is hard and cruel. From the group comes a strong smell which was felt a long time afterwards. The men seem to be conscious of Helge´s presence but they take no notice of him passing by, walking in an almost military fashion on the frosen ground. The sound of their footsteps is clearly heard and the troop continue out on a nearby field. Looking out on the field Helge observes a "strange, blue violet light, hidden in some sort of fog". The light is so intense that he has never seen anything like it. Suddenly there is a whining sound in the air and the whole sight is gone. Helge explains to Anders Liljegren that he has wondered a lot about this meeting and also told some friends of what happened. Some believe him, other doubt his story: "I met them myself, I heard the footsteps, saw their eyes and faces, felt the smell... I have never experienced anything like this since and when it happened I was fully conscious... These were no ordinary people I met, they must have been from another world." 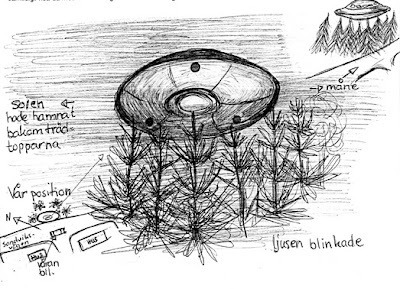 After Anders Liljegren´s interview Helge was contacted by several journalists and ufologists. He was obviously affected by the then prevalent view that this must be space people. 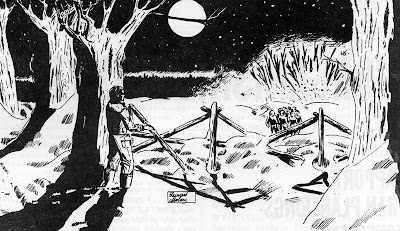 Extraterrestrial visitors was the usual interpretation for these typ of sightings far into the 1970s. 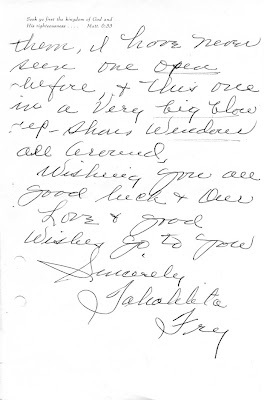 This is very noticeable in a letter written by Helge Eriksson to UFO-Sweden some time later. Probably he had been convinced of this theory by the ufologists who contacted him. 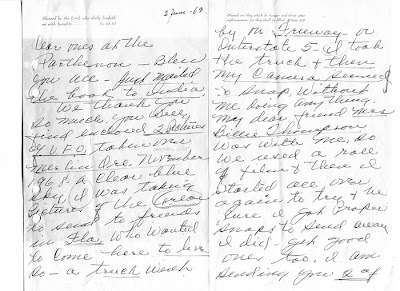 He writes in this letter: "In January 1931 I had a strange meeting with space people whom I both heard and observed... My first thought was that this must be people from another planet". This is obviously a rationalization. It is highly unlikely that a young farmhand in 1930s Sweden would associate such an experience with space people. 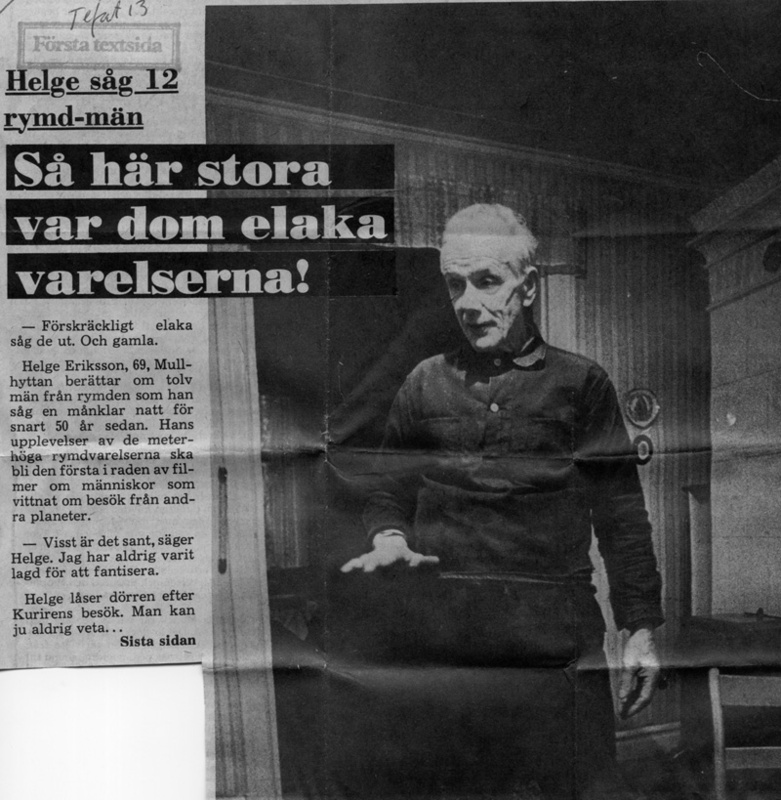 Their is no mention of extraterrestrial visitors in Anders Liljegren´s interview nor in the first narrative written by Helge in the Swedish magazine Saxons veckotidning 1974. 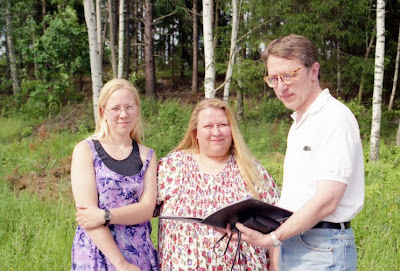 In his second book Besökare från kosmos (Visitors From Cosmos), Swedish ufologist Mr. Boris Jungkvist comments on this case in typical ET fashion: "Everything indicates that he has witnessed a classic UFO landing. Maybe this was the first UFO landing case and observation of humanoids in modern times in Sweden." 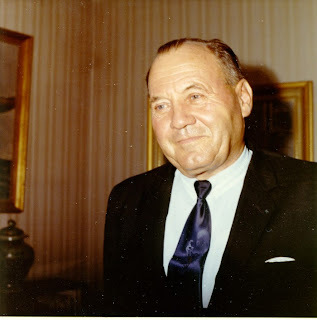 Boris Jungkvist was a fervent exponent of the ETI hypothesis, heavely influenced by the grand old man of Swedish ufology, APRO representative Mr. K. Gösta Rehn. 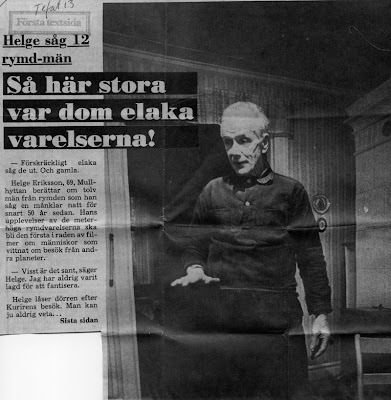 He was the Keyhoe of Sweden, advocating the extraterrestrial theory in his four books in the 1960s and 70s. 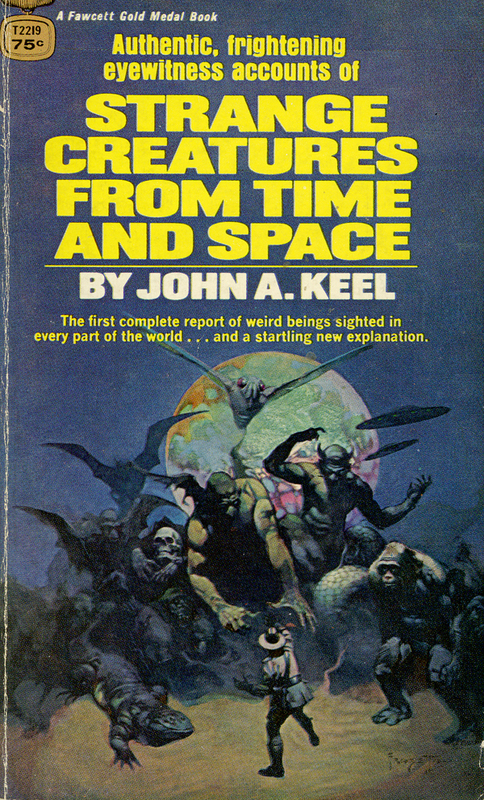 As a hardline atheist and materialist Rehn regarded the theories of John Keel and Jacques Vallee as "a terrible blind alley". He fought furiously against anything that could be regarded as occultism in ufology. The ETI theory was the only scientifically acceptable. Anyone reading the narrative of Helge Eriksson and somewhat aquainted with folklore must notice the similarities to the many stories of leprechauns. This was what Jacques Vallee discovered in the 1960s which resulted in his classic Passport to Magonia (1969). 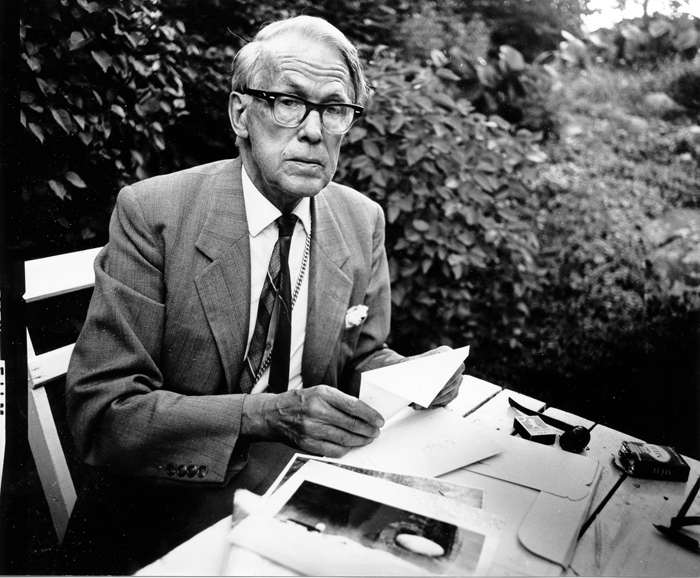 To exponents of the psychosocial theory Helge´s experience is an example of a culturally determined vision or hallucination. 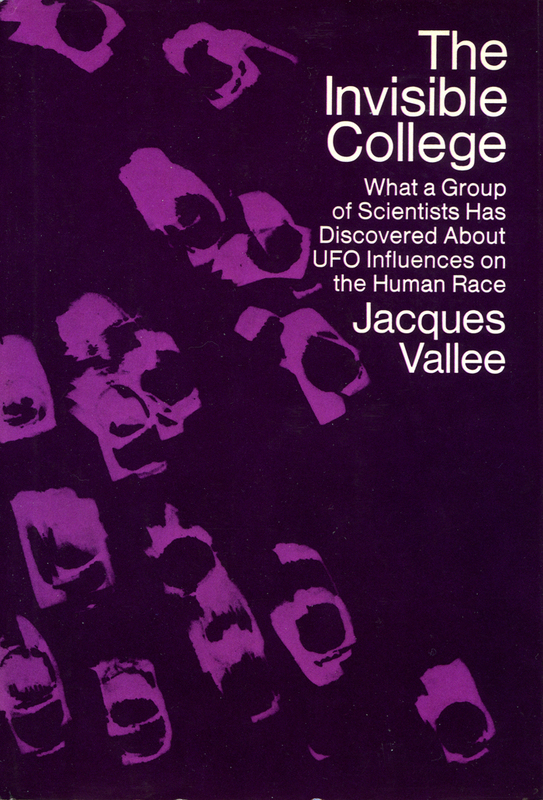 But Vallee was also a student of the hermetic and esoteric traditions and his interpretation went in another direction: "I believe that the UFO phenomenon represents evidence for other dimensions beyond spacetime; the UFOs may not come from ordinary space, but from a multiverse which is all around us, and of which we have stubbornly refused to consider the disturbing reality in spite of the evidence aviable to us for centuries. Such a theory is required in order to explain both the modern cases and the chronicles of Magonia - the abductions and the psychic component." (Dimensions. 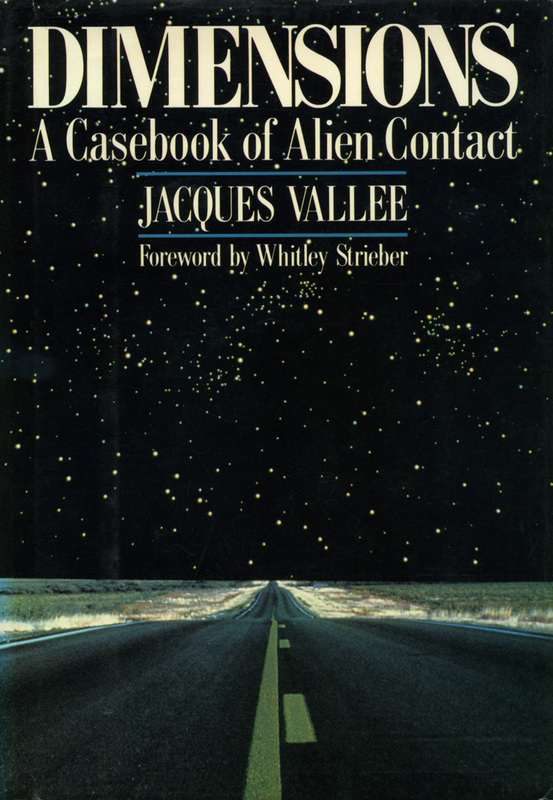 A Casebook of Alien Contact, p. 284). On the internet I recently found an interesting variation of the multiverse theory proposed by Jay Alfred, an independent researcher and consultant to Arkansas Paranormal and Anomalous Studies Team (ARPAST). He is also research director of Dark Plasma Life Research Organization. 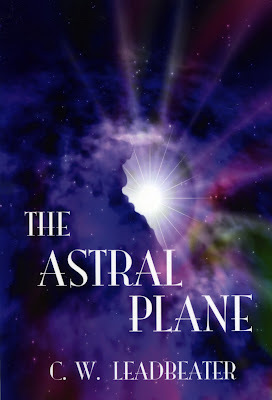 Jay Alfred writes: "Dark Plasma Theory explains a wide variety of phenomena associated with genuine sightings of aliens, ghosts, deities, jinns and angels by both individuals and groups - using an internally consistent scientific framework. These sightings betray the presence of plasma-based life forms originating from a counterpart sister Earth gravitationally coupled to the visible Earth." The dark plasma theory is basically the esoteric tradition teachings presented in a different terminology. It has much in common with theosophist Charles Leadbeater´s taxonomy of the inhabitants of the "multiverse": human, non-human and artificial, presented in his classic The Astral Plane (1895). Like Helge Eriksson we stand a good chance, according to Leadbeater, of encountering a wide variety of entities, not all pleasant. 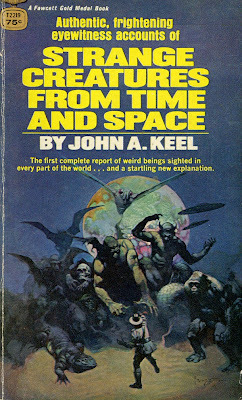 I come to think of the suggestive last paragraph of John Keel´s Strange Creatures From Time and Space: "Belief - or disbelief - will come to you from another direction. Next week, next month, or next year you may be driving along a deserted country road late at night and as you round a bend you will suddenly see..."
As a young student in the mid-1970s I studied history of religions and philosophy at the University of Stockholm. 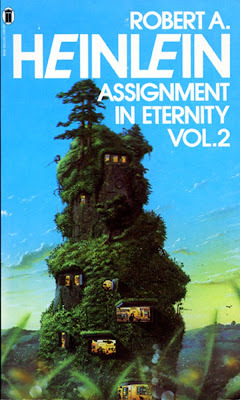 Already an active ufologist - AFU was founded in 1973 - and an avid reader of esoterica I entertained plans for an academic career researching new religious movements. Somewhat to my surprise I was made aware of that this was not an area of inquiry endorsed by the institution. Rather it was shunned and obviously regarded as a non-legitimate field of study. I finished a short thesis on the Kabbalah and tried academic philosophy instead but found it rather boring and entered the Swedish School of Information and Library Science. I have never regretted this choice as you may have guessed from the wonderful quote at the top of my blog. Perhaps I was twentyfive years ahead of my time because during the last decades a minor cultural revolution has occured in the academic world. Today their is no problem studying new religious movements and what is even more surprising, esotericism has entered the Academy as a legitimate field of study. There are now three universities for the interested student to choose between: Sorbonne, Amsterdam and Exeter, United Kingdom. 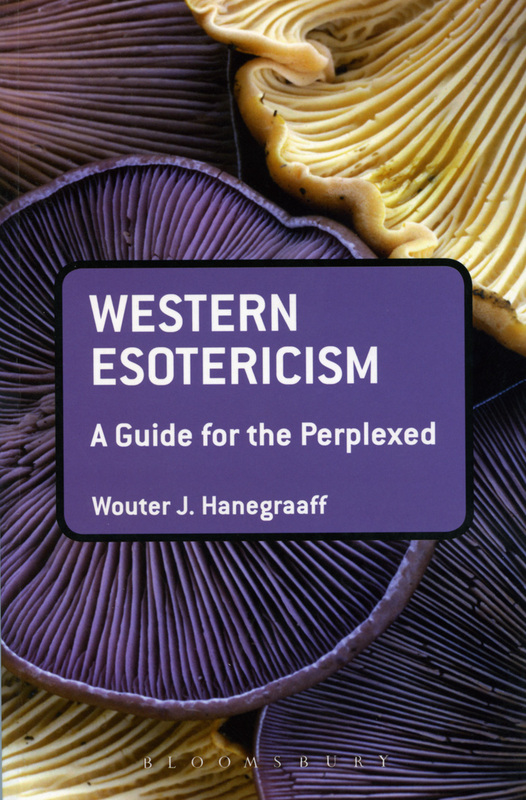 An excellent introduction to what is now labelled Western Esotericism and how this earlier taboo discipline found its way into the universities is Esotericism and the Academy by Wouter J. Hanegraaff, professor of History of Hermetic Philosophy and Related Currents at the University of Amsterdam. 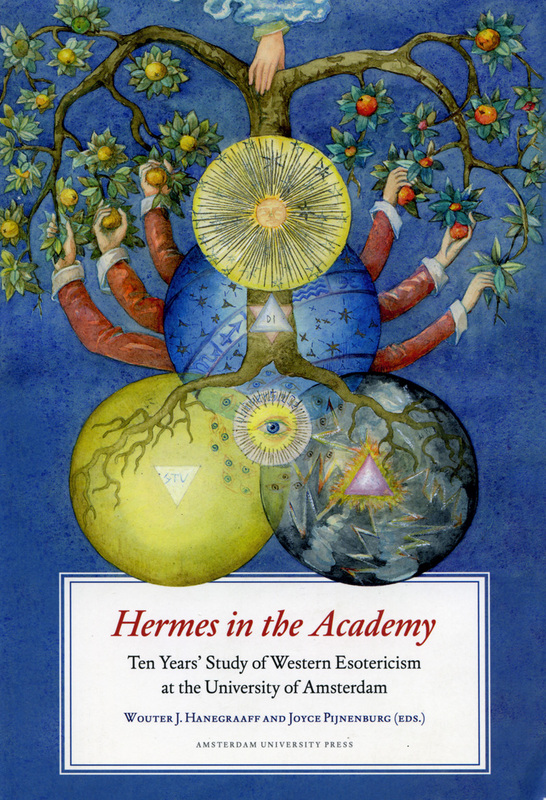 A companion volume is Hermes in the Academy, edited by Wouter J. Hanegraaff and Joyce Pijnenburg. In his introduction to Esotericism and the Academy Hanegraaff gives some interesting glimpses of his problems, as a young university student, to learn more of the then taboo subject of esotericism: "I was intrigued and wanted to learn more, so I asked my professsors for advice. And that is when I began having my first experiences with a phenomenon that has ultimately led me to write this book. My interest in this domain seemed to make my teachers uncomfortable, and to my repeated requests for information and suggestions, they responded by tossing the embarrasing topic on to another collegue as if it were a hot potato. Nobody seemed willing to touch it." A few decades ago the academic climate made it almost impossible to study esotericism, even in a historical and neutral way. Thanks to pioneers like Wouter J. Hanegraaff the situation has begun to improve. 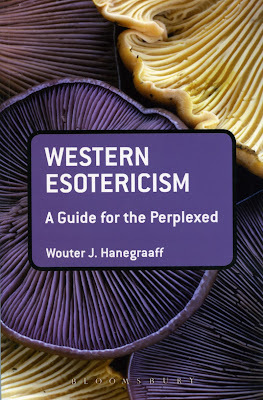 In his article Some Remarks on the Study of Western Esotericism, Hanegraaff relates the problem of even mentioning the word esotericism in academic discussions: "...one may find that some excellent specialists hesitate or flatly refuse to participate, simply because being associated with "esotericism"." Although academic esoteric research is neutral and does not adress the ontological issue, the question of truth, Hanegraaff displays a very open attitude to the possibility of new knowledge: "All that I do know is the prime directive that should guide scholarly research and intellectual exploration: not to hold on what we already know well enough, allowing it to dominate the whole of our vision and thought, but being ready to discard our prejudices and revise our preconceptions in the light of new knowledge." As a ufologist and investigator of paranormal phenomena I adress esotericism in a somewhat different way, asking questions that even academic scholars do not touch. I have often pointed out that Theosophy is contactee experiences minus spacecraft. That is, many of the original proponents of the esoteric tradition claimed both physical and psychic contact with "aliens" often named Brothers or Adepts. Check this list on such experiences. Compare this list with classic ufo contactee reports, investigated by ufologists. 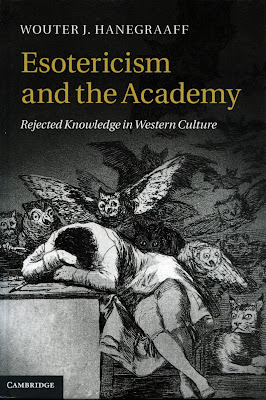 This way of looking at esotericism changes the perspective and opens up new possibilities of evaluating the very difficult ontological issue, or in everyday language - the truth or reality behind the claims. But this kind of research, as well as, UFO field investigation, would never be possible within an academic framework. Any university scholar suggesting such an inquiry would flogged by his collegues and would meet with a crescendo of criticism from the organised skeptics howling irrationalism, pseudoscience, anti-modernism. Just look at the problems for academic research in parapsychology. This reminds me of a favourite quote from Robert A. Heinleins fascinating novel Lost Legacy, printed in Assignment in Eternity vol. 2: "Any suggestion that their might be something to consciousness that can´t be explained in terms of physiology and mechanics is as welcome as a Saint Bernard in a telephone booth." My proposition for inquiry is what I iconoclastically use to call "real research". Simply because it tries to answer the basic question we all want to know - what is the truth? But as this type of research is not possible within todays universities the only other option is creating privately funded archives and research institutions like AFU. And also gather a group of open minded, non conformist scholars in a new Invisible College, like the one created by Allen Hynek and Jacques Vallee in the 1960s. This work is a real intellectual challenge. 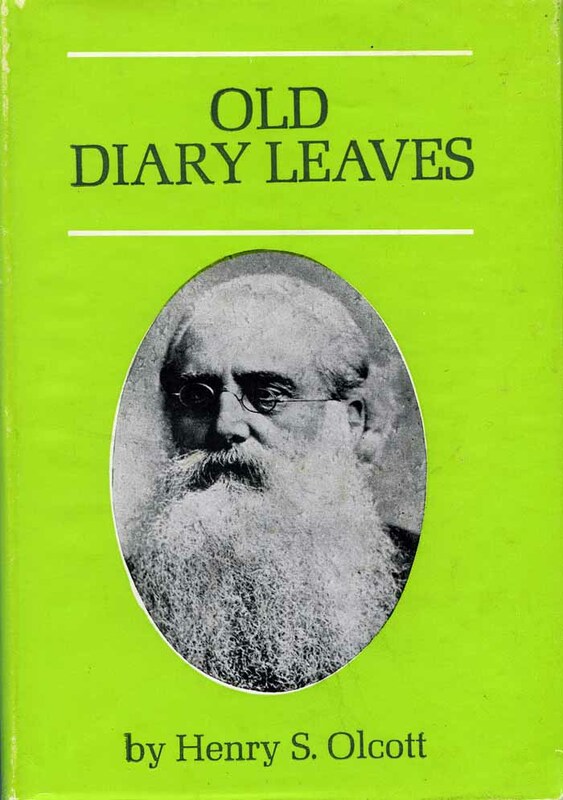 For a few weeks I have immersed myself in the fascinating diaries of Henry Steel Olcott, one of the founders and the first president of the Theosophical Society. His classic Old Diary Leaves in six volumes are a treasure trove of paranormal phenomena. I have often advised UFO collegues to study the writings of the first generation Theosophists and compare them with the contactee literature. Ufologists will be surprised to find the same type of phenomena in both genres. 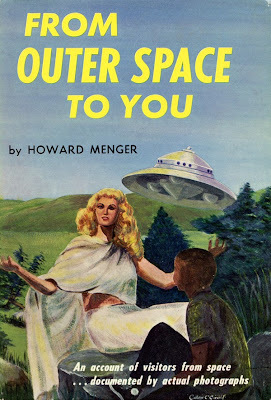 Theosophy is contactee experiences minus the saucers. And a good start is the first volume of Olcott´s Old Diary Leaves, covering the period 1874-1878. Henry Steel Olcott (1832-1907) was a lawyer, journalist and a pioneer in psychical research. He spent twelve weeks in 1874 investigating the materialization phenomena of the famous Eddy brothers in Chittenden, Vermont. This was eight years before the foundation of the Society for Psychical Research in London 1882. 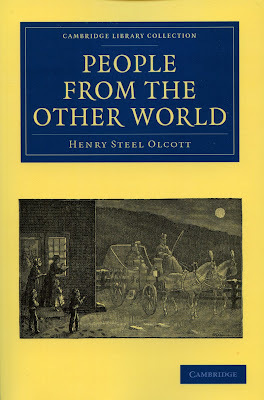 Olcott documented his research in a massive 492 pages opus, People From the Other World (1875). 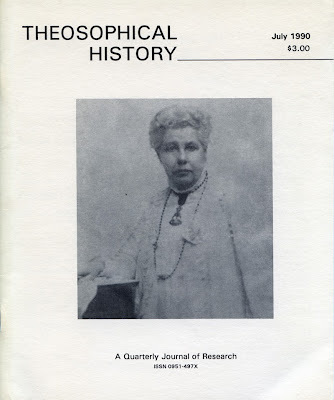 Present day Theosophists reading Old Diary Leaves will probably be both surprised and chocked by the often very critical comments on Helena Petrovna Blavatsky and her character in the diaries. This is definitely no hagiography of the famous H. P. B. as she liked to be called. Olcott is unusually candid regarding both her faults and merits. Listen to this quote on Blavatsky´s character, which one would rather expect from sceptical hardliners: "So fitful, so capricious, so unreliable, so exacting, so tempestuous as to call for heroic forbearance and self-control if one would live and work with her in an unselfish spirit". (p. 50) And Olcott gives several examples of these less admirable traits in his diary. Of course he also gives many examples of the very good sides of Blavatsky. But what made this rather critical investigator of the paranormal endure living with Blavatsky and becoming her foremost co-worker? A large part of the answer is obviously - phenomena. His diaries are filled with all the various types of psychic experiences and phenomena he encountered both together with Blavatsky and alone. We can follow his thoughts and doubts about what is happening. But there was one particular early experience that was a sort of turning point in his Theosophical career. It occured in New York City 1877. "Our evening’s work on Isis was finished, I had bade goodnight to HPB, retired to my own room, closed the door as usual, sat me down to read and smoke, and was soon absorbed in my book. All at once, as I read with my shoulder a little turned from the door, there came a gleam of something white in the right-hand corner of my right eye; I turned my head, dropped my book in astonishment, and saw towering above me in his great stature an Oriental clad in white garments, and wearing a head cloth or turban of amber-striped fabric, hand-embroidered in yellow floss silk. Long raven hair hung from under his turban to the shoulders; his black beard, parted vertically on the chin in the Rajput fashion, was twisted up at the ends and carried over the ears...the Presence was seated in the other chair beyond the table. He told me he had come at the crisis when I needed him, that my actions had brought me to this point, that it lay with me alone whether he and I should meet often in this life as co-workers for the good of mankind...Suddenly the thought came into my mind: "What if this be but hallucination; what if HPB has cast a hypnotic glamour over me? I wish I had some tangible object to prove to me that he has really been here, something that I might handle after he is gone!" The Master smiled kindly as if reading my thought, untwisted the fehta [turban] from his head, benignantly saluted me in farewell and was gone: his chair was empty; I was alone with my emotions! Not quite alone, though, for on the table lay the embroidered head cloth." 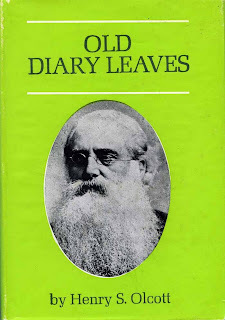 In his diaries Olcott relates how he later several times met this man in India, sometimes together with other members of the Theosophical Society. But it was this exceptional experience that made him decide to devote his life to Theosophy. To his very sceptical friend Mr. A.O. Hume he tried to explain his decision in a letter September 30th, 1881: "... I would never have taken anybody´s evidence to so astounding a claim as the existence of the Brothers, but required personal experience before I would head the new movement... I got that proof in due time". The striking resemblance between these early experiences by the first generation Theosophists and the contact claims of George Van Tassel, Howard Menger, Orfeo Angelucci, Paul M. Vest and many others should in my view be further investigated. Very little research has been done in this direction. Visitors to AFU are coming from near and far and we are always glad to welcome visitors from around the globe - and other globes - if they happen to be around. 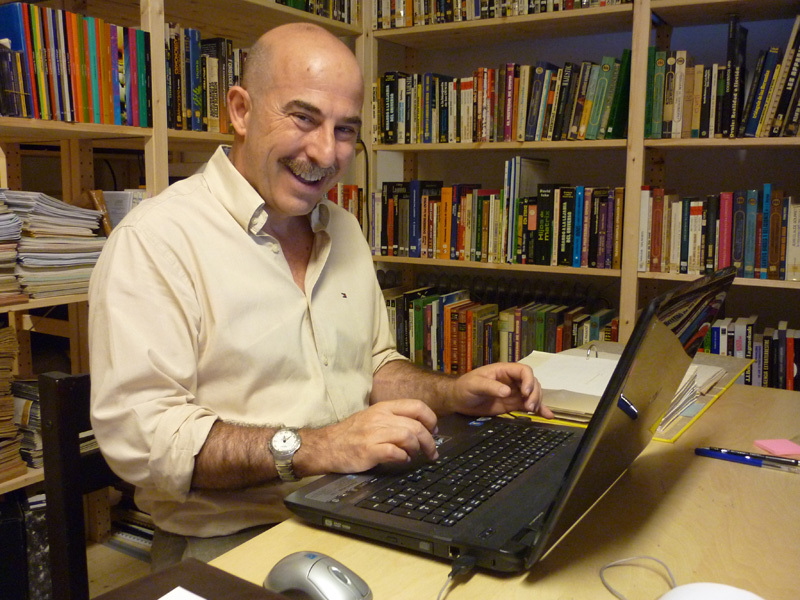 On Saturday, August 3, Luis R. González arrived from Malaga, Spain for a two weeks stay at Norrköping. He will be studying our Spanish files, especially the large collection we received from Centro de Estudios Interplanetarios (CEI) in May this year. Luis González is one of the participants of the EuroUfo.Net, the virtual community of European UFO researchers. AFU is supported by and attracting investigators and researchers from all shades of the ideological spectrum, believers, agnostics and skeptics. You are welcome to the archive whether you are a professional scholar or amateur, whether an Atheist, Humanist, Catholic, Buddhist, Theosophist, Spiritualist or whatever. 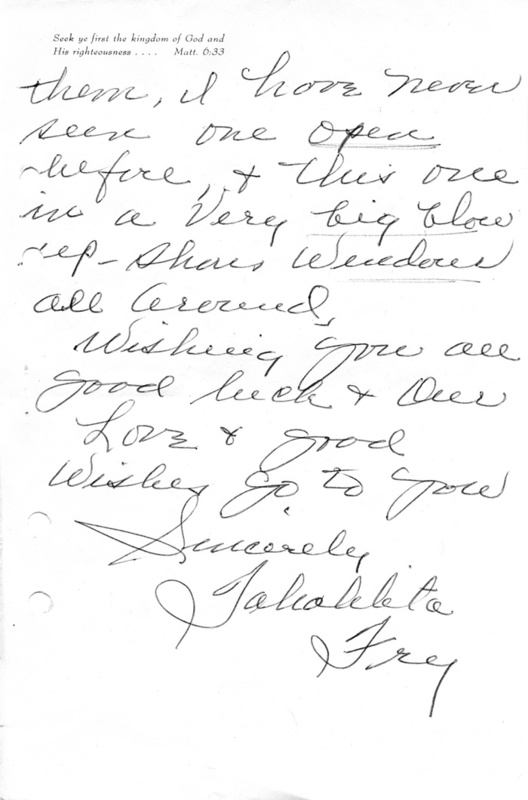 Our only wish is that you have a serious interest in researching and studying our files and support our efforts. We collect data and material from all possible aspects of our subjects. 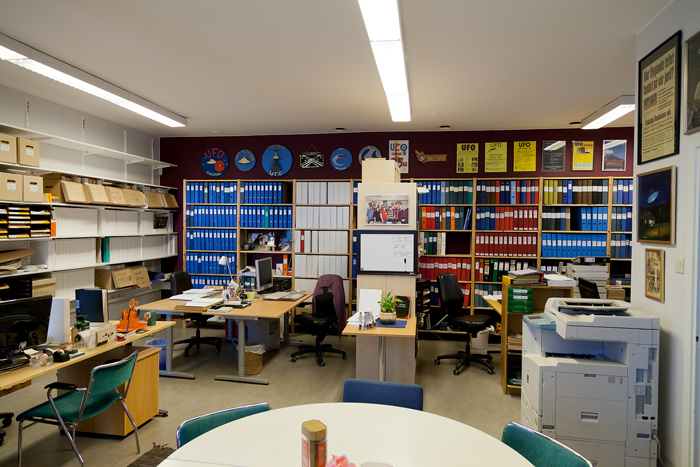 At AFU you can find doctoral theses as well as new age and cult publications from all over the world. 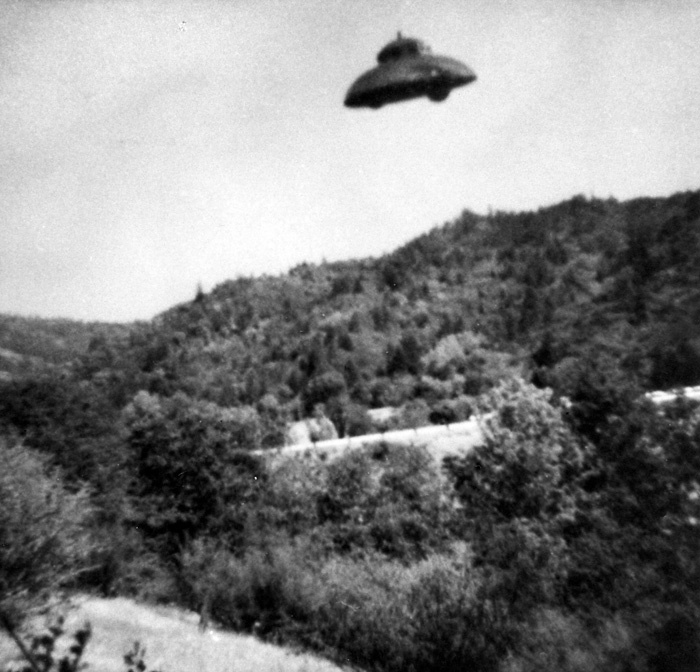 This ideological stance makes us a unique repository for everything involving UFOs, Forteana, folklore, paranormal phenomena, Esoterica etc. Our aim is to develope AFU as a world inheritance, although we will probably not be recognized as such by UNESCO. Next month we hope to launch our new and very much updated AFU website. Although AFU is a an independent, nonprofit foundation we are associated with the Swedish national organization UFO-Sweden. The ideology of UFO-Sweden was brilliantly formulated by the former UFO-Sweden chairman, Clas Svahn, in the beginning of the 1990s. It has been labelled the third way ufology which implies neither sceptical denial nor naïve belief but critical investigation and documentation based on the best aviable empirical data. In my view this in the only scientifically and logically tenable position on the very controversial subjects we are dealing with and the safe middle ground to avoid rigid ideological dogmatism. We try to keep a reasonable open mind to various theories and assertions as we in many cases really have no idea what we are investigating. “If you know the answer beforehand, it isn´t research” (Allen Hynek). 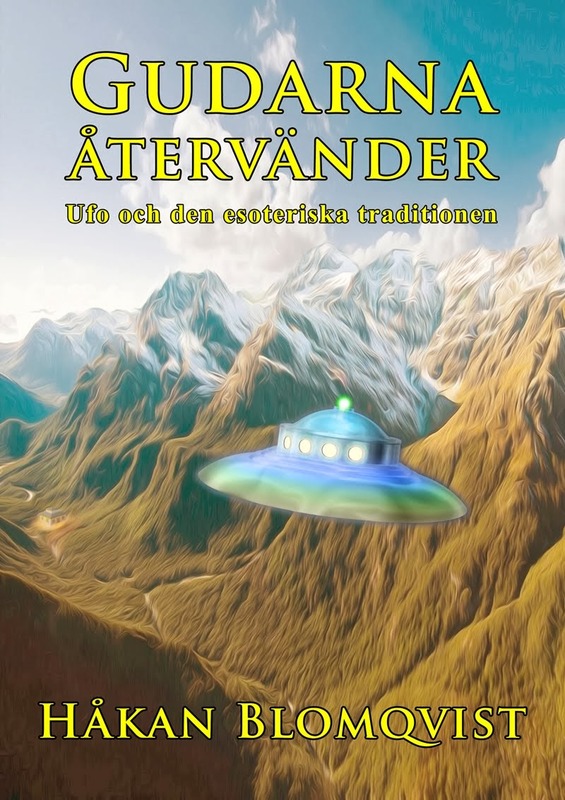 As my blog, since april 2013, is written in English I now and then present UFO cases that have only been published in Swedish. 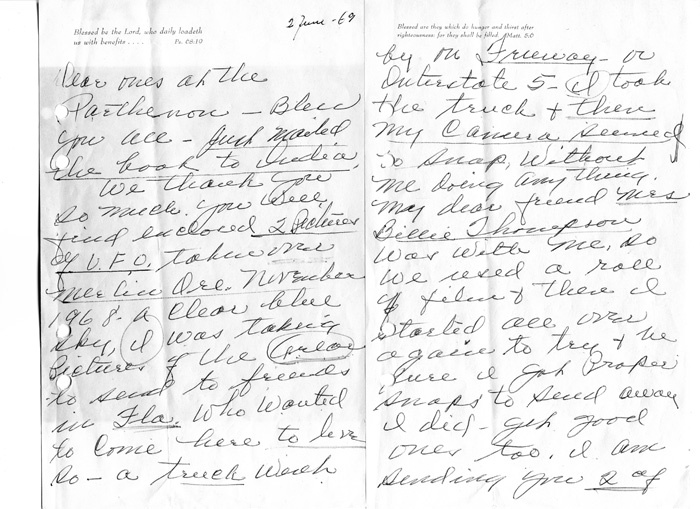 Here is a classic flying saucer report that is still unresolved. Björkvik is a small community situated in the southern part of the Swedish province of Södermanland. On October 11, 1994 I was invited to lecture on UFOs to adult students at Björkvik. After the lecture a woman in the audience told of an fascinating close encounter she and her daughter had in September 1989. The case sounded so interesting that my AFU collegue, Anders Liljegren, and I decided to do a thorough field investigation. At 6.10 P.M. on September 9, 1989 Kerstin Jonsson and her daughter Tina are travelling by car not far from their home in Björkvik. They have just left Tina´s friend at the local bus station. Kerstin is driving and 13-year old Tina is sitting in the back seat. 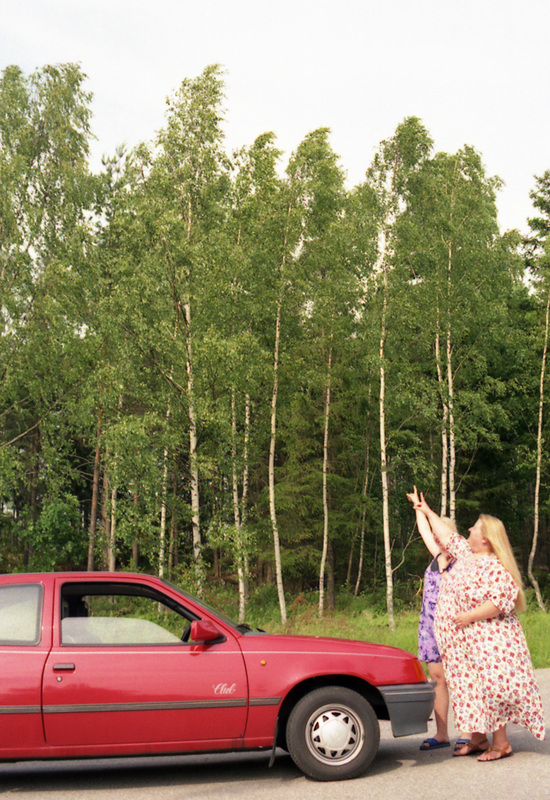 A couple of hundred meters from home Kerstin notice an object hovering above the trees beside the road. She tells her daughter and they drive very slow, closer until they are right below the strange object. Tina is afraid and wants to go home but Kerstin stops the car and roll down the car window. No other car show up and there is a strange silence all around. No sound is heard from the object. The shape is a classic saucer, about five meter i diameter and of dark metallic colour. Three lights are seen on the underside, blinking at regular intervals. Some form of hatch is also visible. Kerstin and Tina get a very god look at the object which is not more than 15-20 meters above them. Kerstin wants to have a better look so she opens the car door and put one foot on the ground. But now Tina is very agitated, crying "you´re crazy, don´t go out". At the same time the object begins to spin counter clockwise and move out over the road. Kerstin can now see the object from the side. There is a dome on top with several windows from which comes a yellow light. The object makes a fast turn and disappears towards lake Yngaren. Kerstin and Tina drive home and Kerstin´s husband Sture notice that they are both very upset. 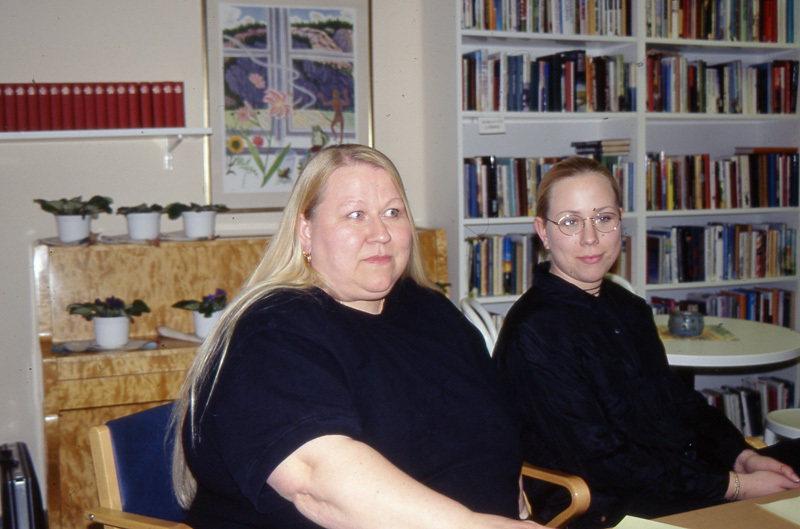 Anders Liljegren and I interviewed both witnesses separately and also the husband Sture. He is a skeptic but open minded to the possibility of UFOs. "They were very agitated when the arrived home. And Tina was absolutely terrified." Sture consider their story legitimate as neither his wife nor daughter use to fantasize. The frustrating aspect of this observation is that there are at least six more witnesses to this object, neighbors to the family, but they refuse to talk to us. 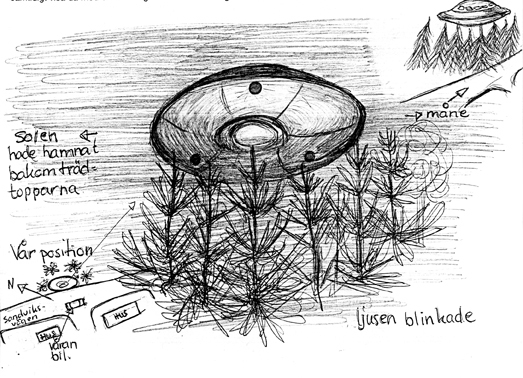 But in july 2008 UFO-Sweden received an anonymous letter from one of the other witnesses. He was 16 years at the time and, together with his mother and sister, observerad the object over lake Yngaren. They travelled by car and noticed the object hovering over the lake. It was dark metallic and had lights blinking underneath. The object suddenly moved very fast and disappeared. It is not very often we have close encounter cases with six or more witnesses observing an object from different positions. Hopefully the other witnesses will come forward so we can have a better documentation of this interesting report. While browsing among recent blog entries I found some interesting comments on contactee Daniel Fry in the Mark Russell Bell blog. 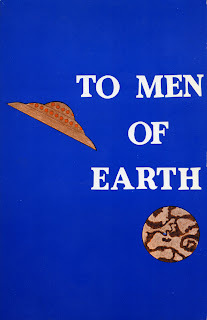 I wasn´t aware of that Fry in the 1973 edition of his books The White Sands Incident (1954) and Alan´s Message: To Men of Earth (1954) included a revised version of his first book with information on his second contact with Alan, not mentioned in The White Sands Incident. 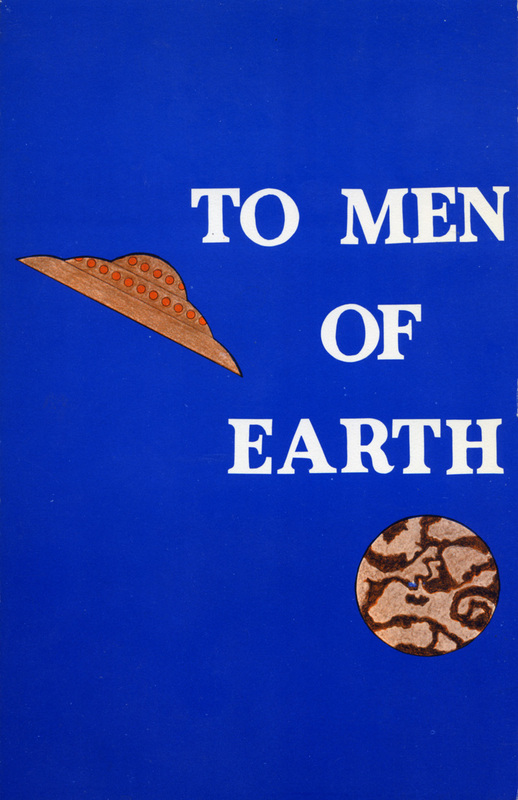 The 1973 edition is simply named To Men of Earth. The second contact occurred while Fry was at his work at Aerojet where he tested rocket motors. One day he suddenly hears Alan´s voice very clear, “as though he was standing at my side”. During this conversation Fry is asked whether he wish to assist the visitors in their work and also what is expected of him. Alan explains: "The time has come when you must make the final decision as to whether you will be that person. It is a free choice on your part, and there is no penalty for refusal. If you do not wish to assist us, you will be permitted to return to your quarters at once. All memory of this meeting and the previous one will be erased from your mind, but everything else will be the same. You will be no worse off than before we came." 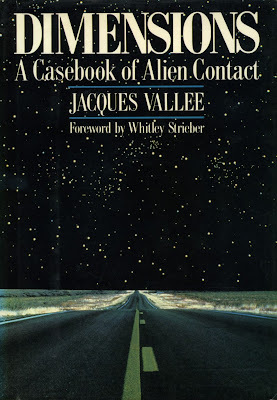 (p. 88) That his memory of his first contact and this offer is to be erased if he says no to the proposition is a rather unusual claim coming from the 1950s contactees. Bless you all. Just mailed the book to ………… We thank you so much. 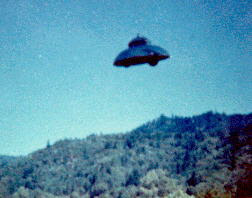 You will find enclosed two pictures of UFO taken over Merlin, Oregon November 1968. A clear blue sky. I was taking pictures of the parlor to send to friends in Florida who wanted to come here to live so – a truck went by our freeway – or interstate 5. I took the truck and then my camera seemed to snap without me doing any thing. My dear friend Mrs Billie Thompson was with me, so we used a roll of film and then I started all over again to try and be sure I got proper snapshots to send away. I did get good ones too. I am sending you 2 of them. I have never seen one open before. …. once in a very big glow …………………………..
Wishing you all good luck. 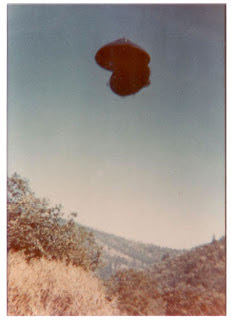 When Timothy Good, during an interview in 1976, asked about these photos Daniel Fry asserted that Tahalita did not see the craft when she took the pictures. The craft is totally different from the one seen in his 16mm film and looks much more like the classic Adamski type bell shape. So how are we to interpret the contact claims of Daniel Fry? Based upon my own 40+ years of investigations of physical contact experiences I can only conclude that some contact claims are obviously real. 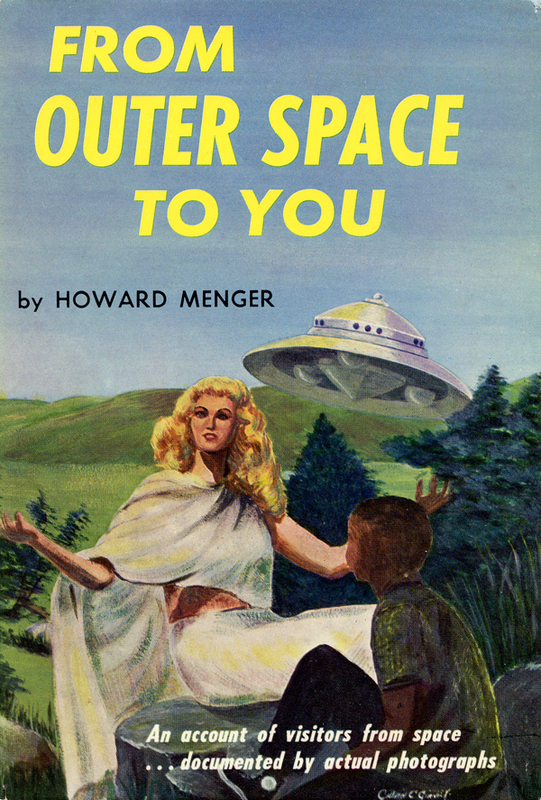 The contactees do interact with some type of alien visitors but not necessary space people. I have proposed the esoteric intervention theory as an alternative working hypothesis. 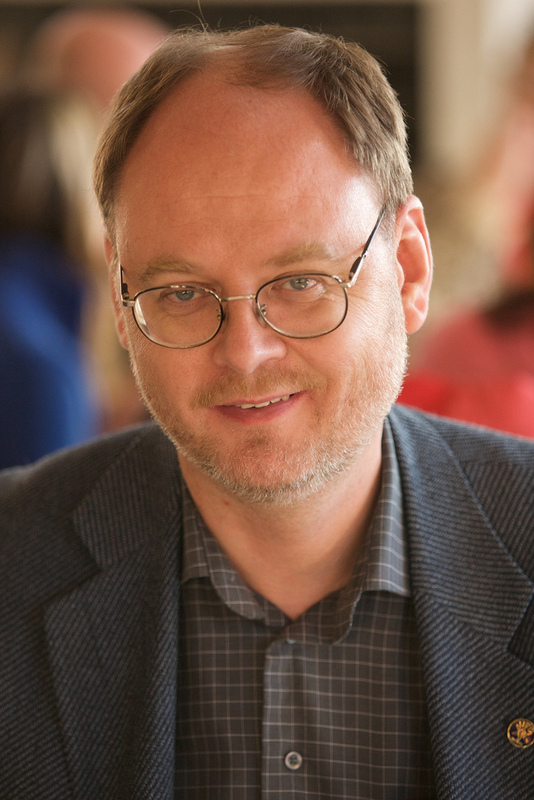 Dr. Joscelyn Godwin has named his theory the Hidden Hand. If we accept this as a working hypothesis, could the same secret society also have created some of the first UFO phenomena and contacts with the same intent - changing our worldview? In my study and documentation of the 1950s contactees I have discovered data and indications confirming some form of "Hidden Hand". This is of course a conspiracy theory but not of the usual variety. Here we have what could be called a benevolent conspiracy. Sufi teacher Idries Shah would call this method education through astonishment. Joscelyn Godwin is very much aware of the problem of presenting such a theory as an academic scholar. I am pleased to notice that he is not trapped in the reductionist- materialist cage but keeps an open mind to other possibilities. That is real research. 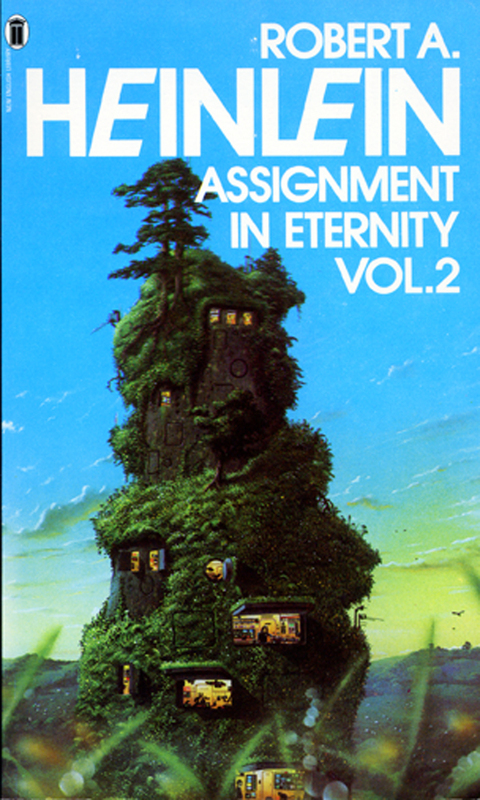 In part II of The Hidden Hand he gives this position statement: "My own mind is open to the possibility of events for which materialistic science, and the historical scholarship modeled on it, has no place; consequently, I do not automatically dismiss the idea of immaterial influences, such as were suggested byt many writers on the Hydesville incident... I would suggest that there was another Hierohistorical event in the early 1870s; another move to affect public opinion, mainly by working from within the Spiritualist movement." (Theosophical History, vol. 3:3, July 1990, p. 72-73).